I received so many fun comments answering the question "tell me your best memory of your favorite summer". There were stories of first love, meeting your husband or giving birth to your first child. There were also touching stories of sharing the last summer with a dying parent, vacationing every summer with grandparents, cousins and siblings or special trips traveling through foreign countries. To be honest, I have not made it through all 620 comments, but I promise I will. Welcome to the 100 new followers. I really do enjoy your comments and know that it takes time to read my blog and leave a comment. I appreciate you all and hope I can inspire you by sharing my enjoyment of sewing, quilting, family, cooking, gardening and whatever pops into my mind. 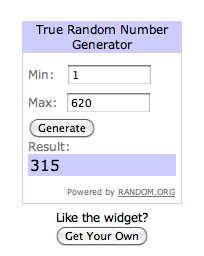 Randomnumber.org chose number 315. Since blogger starts renumbering comments after 200, it looks like she is comment #115, but do the math and it's all good. I will be in touch by email and you will have 5 days to get back to me with your mailing address. Thanks, again, to Julie of the Intrepid Thread for sponsoring this generous FQ stack of SummerLove. 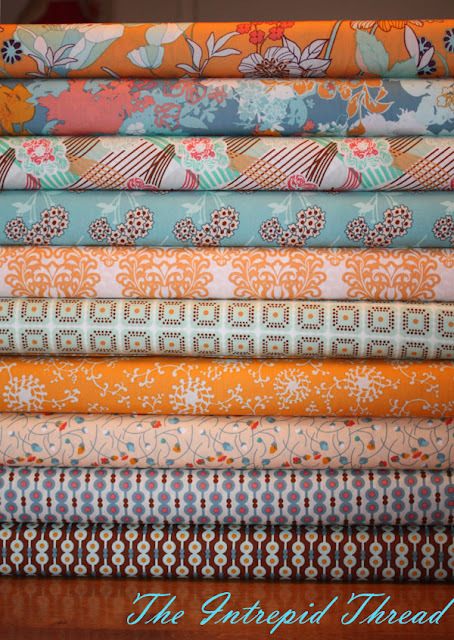 Please remember to visit the Intrepid Thread when shopping for fabric. Julie has a beautiful selection and great prices, too. Congrats to Marg - we like Marg!! Congrats to you too with 100 extra followers! Oh bugger, didn't win this beautiful fabric. Well done Marg! Congrats to Marg and thanks to you and Julie for the great giveaway! LOL....thanks guys...and thank you to Dain and Julie. This is a fabulous gift. Good for you that another 100 people are following you!! Hope you had a chance to register for SS today! Wow! 100 new followers! That's awesome. They won't be disappointed! And congrats to the winner! Yay fabric!